Our friends at Mashable decided to post a story called, Social Media Helps Romantic Relationships Thrive. While it’s debatable whether social media helps or hurts relationships, I was a great honor to be asked to chime in on the story along with Alexandra Samuel, Ph.D. and Rob Cottingham, as well as Dr. Karen Ruskin. Meeting someone new used to be more exciting. Being able to Google someone and read their Facebook, Linkedin, About.me and Twitter profiles in full, takes all the initial mystery and intrigue out of getting to know someone. This is the new dating mistake many are making, says Julie Spira, online dating and netiquette guru and author of The Perils of Cyber-Dating. ?When your relationship is new, I say avoid connecting on social media sites at first,? Spira tells Mashable. ?Sure he or she may be excited about your relationship and can easily follow you on Twitter, but if you receive a friend request before or after a first date, it?s best not to accept it.? A Facebook request or Twitter follow may seem harmless. However, experts warn being fast friends on social media could result in hurt feelings. ?Remember that it?s a new relationship and one may still be playing the field while the other only has eyes for you,? Spira says. ?Becoming friends prematurely may result in hurt feelings when you see his photo posted hugging another woman. Even though it may be his cousin, your feelings will be hurt and you might be jumping to conclusions.? How long should love birds wait? It could take a couple weeks or a couple months. It really depends on the individuals in a relationship, experts say. It was an honor to be called on by my friends at GalTime to chime in on the dos and don?ts for ?Dating in a Facebook World.? One of the questions I hear most often from singles is, ?Should I send a Facebook friends request before our first date?? Sure, I know you?re excited about meeting him, but stop daydreaming about changing your relationship status.? You might have taken a digital peek to see how many friends you have in common on Facebook, but once someone accepts or rejects your request, it goes on the same place on the totem pole as having the ?talk? to be friends, or “more than friends” with someone. It just becomes uncomfortable and it’s hard to get back on the same digital page. Suddenly your new beau might be worried that you?ll be spying on his wall. Or even worse, he may project that you?ll turn into a cyber stalker and question him about his female cousin’s arm around him from 6 months ago. The thought of his first date with you suddenly becomes uncomfortable, and he may just cancel with an excuse that it?s his turn to watch the kids, or there?s a work project he has to tend to. If this sounds familiar, I urge you to take a big digital breath and log off of your Facebook account until your first or even second date is over. Facebook dating can be complicated. Balancing the traditional courtship with information-at-your-fingertips can be tricky. My advice to you, keep the information from that Google search results to yourself and just be the authentic you. You?ll have plenty of time to post things on your Timeline if the relationship goes in the right direction. It may be terribly tempting to friend request the guy you met at the bar last night?especially if his Facebook page is locked up tight. After all, how else can you spy on those old photos of him and his ex that he hasn?t gotten around to taking down yet? But Spira says: think before you friend. Chances are, you?re not on the same digital page yet. And a virtual friendship could ruin your chances of a real life relationship. ?It?s just too soon and you aren?t in a relationship, nor are you even really dating just yet,? she says. ?One of you may be dating several people at a time, while the other may be single-focused. If you become Facebook friends prematurely, your relationship may end quickly as well.? Or it may never get off the ground at all. ?I?ve known women who have cancelled dates after receiving a Facebook friends request,? she says. Want to know every last nauseating detail of your second cousin?s first date? How about your boss?s cutesy pet name for his third wife? Not so much, right? Well, most likely your friends aren?t interested in the nitty gritty of your love life either! So keep it offline. ?Saying I love you on Valentine?s Day is appropriate on your sweetheart?s wall if you?re friends on Facebook,? says Spira. ?Saying I love you every day and talking about details of your first kiss on Facebook breaks the rules of netiquette. Your friends and you beau don?t always want you to “Kiss and Tell.?? That goes for your relationship status as well. ?While your Facebook friends will be happy for your new found love, they really don?t want to watch your status change from ?Single? to ?In a Relationship? to ?It?s Complicated? and back to ?Single? again,? says Spira. The date was fun, you had a few drinks, and it seemed like a good idea at the time. But before you post that funny status update or compromising photo?think twice. Remember what goes online stays there… forever. ?You can?t take it back,? Spira says. ?Often these updates are indexed by the search engine. Even if you remove a photo or update from your Timeline on Facebook, it may have already been shared by friends and friends-of-friends.? Click? here for the full article on GalTime with my 12 Dos and Don?ts of Dating in a Facebook World. The subject of breaking up on Facebook is a hot topic these days. Earlier this month, David McCandless published his now-famous Facebook Breakup Chart which spread like wildfire on the Web. We now know what we already realized. Holiday heartbreak is heading into its busy season. With over 1 billion members on Facebook, relationship status changes have become the darling of the Internet. One can’t help but notice the red heart appear and disappear on the profiles of our friends and our new friends, better known as the friends-of-friends. Breakups used to be so simple. You get dumped. You cry about it. You get advice from close friends and family. They tell you how much better off you are without him. You cut all ties from your ex. Then, eventually you pick yourself up, dust yourself off and get back into the game. I have a friend (a real life one) who was recently dumped by her boyfriend of three and a half years. When she came to me for advice it started out as your typical breakup pep talk. 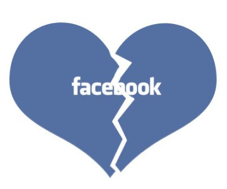 While the situation will vary depending on the severity of the split, there are some basic guidelines to help you handle a breakup in the age of Facebook. According to Julie Spira, social media/relationship expert and author of The Perils of Cyber Dating , one of the most important steps to consider is how to update your status. She says, “I don’t believe singles should constantly change their status from ‘single’ to ‘in a relationship’ to ‘it’s complicated’ and back to ‘single’ for everyone to see. Unless both parties agree on changing their status to ‘in a relationship’ and it’s a serious relationship, no one wants to see the drama. However, it’s the most commented on update you will see on Facebook. People are just curious and want to know the juicy details. If you’re hurt, just delete your status completely to avoid the comments.? Kelly Spann, a marketing and publicity manager in Virginia, learned this lesson the hard way. First off, right after we broke up I totally put him on blast in my status. I was angry, but that definitely wasn’t a classy move. Then I didn’t un-friend him and he didn’t un-friend me. Having to see his status updates, pictures and the various other girls writing things on his wall didn’t help me get over the break up at all. What if you’re the one that did the dumping? Have a heart! You may be ready to move on, but the rules of netiquette say there’s no need to rub your ex’s face in it. If you remain Facebook friends, Spira suggests at least changing your privacy settings to prevent your ex from seeing your activity with your new love interest. Otherwise, your ex may find some pretty creative ways to make your single life miserable. Facebook user Josh Gilbert says his ex knew exactly how to use the social networking site to get back at him after their nasty breakup. “I had made plans to attend Lollapalooza with a girlfriend, but then we broke up.” She went anyway, and only posted pictures of two of my favorite bands – saying to no one in particular – Live from Lollapalooza – jealous? I can’t prove this was an intentional dig, but I’m convinced it was. Even if you delete your ex, there’s still the issue of mutual friends. This one’s hard enough to handle in your day to day life, but Facebook is a whole different beast. Spira says, “There’s no need to delete the entire world because your relationship has ended, but I do recommend changing your privacy settings in Facebook to “friends only.” You can also select the privacy settings individually for each status update if you prefer, where you have the option to select everyone, friends, or friends of friends. Once the drama has subsided and you find yourself ready to get back into the dating scene, Spira says to proceed with caution. “Unless you are actively ready to date again and would like to meet someone on Facebook, take a break from the status relationship change and just don’t post any relationship status at all. If you’re ready to date, go ahead and list yourself as “single” but be prepared to be hit on. It just happens. It was a last minute decision in between the 140 Conference and Digital Hollywood, but I hopped on a plane to attend BlogWorld in Las Vegas to join my social media friends and experts, and I was sure glad that I did. Going to Las Vegas is always a whirlwind trip, and my experience at BlogWorld Expo was no exception to the rule. 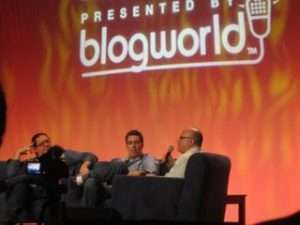 Over 3000 attended the BlogWorld Expo to learn the latest trends in podcasting, social media marketing, blogging, monetization, and the most up to date information from panelists, bloggers, and social media experts. There were parties galore at BlogWorld 10. Our friends at KLOUT picked up guests in their VIP Hummer limo, which seated 20 for their BlogWorld Kloutup reception at the Palms Hotel. Afterwards we gathered at the opening party hosted by Techset at the new Liquid Pool Lounge at the Aria Hotel. It was a time to see old friends and meet new ones to move our online friendships to offline. I was most excited to meet Joel Williams, Blog Tech Guy, who has been part of the Cyber-Dating Expert and Social Media and More teams for almost two years. I graciously and regretfully passed on Brian Solis’s midnight after party at the Wynn Hotel to rest up for a full day of sessions on Day 2. I stopped to say hello to the folks at BlogTalk Radio, Audio Acrobat, signed the Ford Focus Rally car along with many others, and engaged in meaningful conversations in the Sony New Media Lounge. I very much enjoyed watching a few of the Techmunch sessions in the exhibit hall curated by Babette from Bake Space. 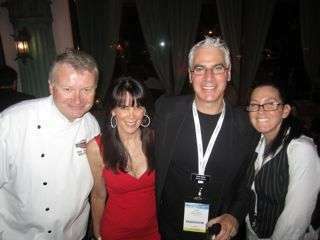 In the evening, we were treated to the BlogWorld Bistro Tasting, hosted by Omaha Steaks in the private Foundation Room at House of Blues. Chef Karl Marsh was on hand serving up amazing appetizers including Filet Mignon Spring Rolls, Bull Wings, Coconut Shrimp, and Jumbo Cooked Shrimp. Our friends at Mashable hosted the Mashbash party at Haze at the Aria hotel. Afterwards, my friend Stephanie Michaels, @Adventuregirl hosted The Love Party at the Beatles Revolution Lounge with a portion of the proceeds to benefit Operation Smile. On Day 3, I hosted Ask the Cyber-Dating Expert Radio Show live from BlogWorld with my guest Dan Abelon, co-founder of SpeedDate. Dan called in to talk about the latest trends in mobile dating as well as their focus on matching based primarily on chemistry over compatibility. SpeedDate now has over 10 million members looking for love online. And they did save the best for last with final Keynote Address. We were promised a closing session full of laughter by former radio executive Rob Barnett, who started My Damn Channel four years ago. We were not disappointed. Shira Lazar introduced the session with guests including Penn Jillette of the famous Vegas duo of Penn and Teller, Adam Carolla, Cali Lewis, Mark Malkoff, and Jeffrey Hayzlett. Penn, who has over 1.6 million followers on Twitter and writes his own tweets, says he types what’s in his heart. He told the group that Social media helps us tell the truth as we see it. Penn multitasks his career with Penn Point on Revision 3 and about 8 others at once. Adam Carolla talked about getting fired from his job and his extraordinary comeback as a super-successful podcasters. The Adam Carolla show now has 200,000 downloads a day. Mark Malkoff, the comedian who is best known as the guy who filmed himself at 171 Starbucks locations in Manhattan as well as the guy who lived in IKEA told us that he stayed in his bathroom for 5 days to detox from Internet addiction. His funny stories get picked up by the major news outlets including CNN. You can find him on MyDamnChannel.com/MarkMalkoff. Cali Lewis from GeekBeat TV shared her passion for social media saying it takes 16 hour a day 7 day a week to keep up with her personal brand. She added that she’s enthusiastic about taking over the world. It’s always a treat to see former Kodak CMO turned bestselling author Jeffrey Hayzlett speak about social media marketing. Hayzlett talked about the 118 from his book The Mirror Test: Is Your Business Really Breathing? He claims it takes 110 seconds for the average elevator ride in New York City and 8 seconds to hook someone in. Hence, the elevator speech about what you do must be honed down to 118 seconds. He added that “Scale is the New Black.” In other words, you’ll need to add several 000s to prove your concept. All in all it was a gathering of sharing information, meeting some of the kindest people in social media, and an educational forum to build our businesses all created by our passions in our niches. Congratulations to Rick Calvert and Dave Cynkin, co-founders of BlogWorld on a very successful and wonderful experience for social media enthusiasts. I look forward to seeing everyone again at BlogWorld 11.